What do you want in a chip? A thin delectable snack? A crispy piece of heaven? All of the above? The best thing is that they’re easy to make when you have the right kinds of potatoes. Small and colorful are the two adjectives to keep in mind when shopping for your spuds. Not because I’m some kind of health food elitist, but because I’m lazy. These types of potatoes are usually softer, making it easier to cut them into thin discs. Okay, have I talked them up enough? Let’s just get right to it and don’t forget to try them with the English-Style Fish on this site. Enjoy! 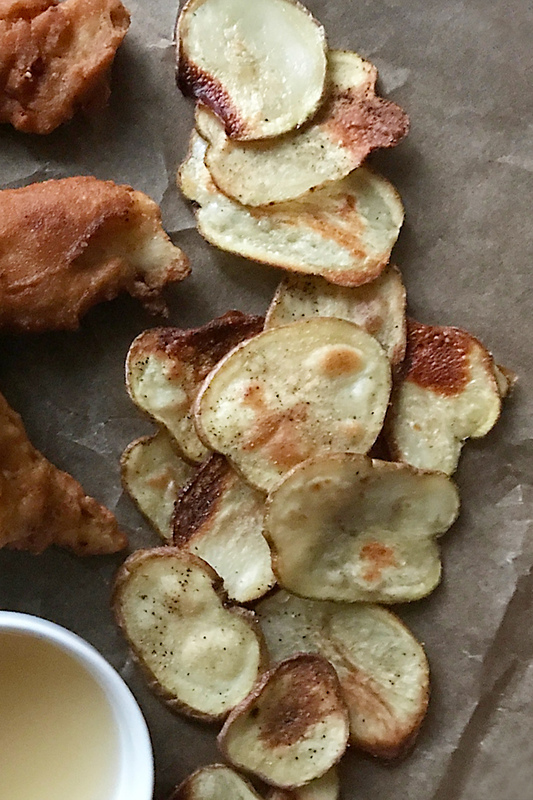 These deliciously crispy homemade potato chips are sure become a lunch or dinner staple. Light and flavorful, they won’t overpower the main entrée. Put all potatoes on baking sheet lined with non-stick foil (this stuff works wonders!) If not using non-stick foil, make sure you oil the pan. I can’t promise they won’t stick a bit after baking. Evenly sprinkle spices over potatoes. Oven bake for 15 minutes on each side or until crispy. Serve with your favorite entree or try it with English Fried Fish (see recipe notes). Pairs great with English Fried Fish. 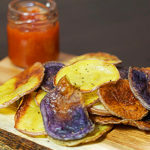 [wpurp-searchable-recipe]Oven Baked Potato Chips – These deliciously crispy homemade potato chips are sure become a lunch or dinner staple. Light and flavorful, they won't overpower the main entrée. – small potatoes of choice (I used 1 purple, 2 red, and 1 yukon), sea salt (or to taste), black pepper ((or to taste)), garlic powder ((or to taste)), , Preheat oven to 400 degrees. ; Chop potatoes into discs. ; Put all potatoes on baking sheet lined with non-stick foil (this stuff works wonders!) If not using non-stick foil, make sure you oil the pan. I can't promise they won't stick a bit after baking. ; Evenly sprinkle spices over potatoes. ; Oven bake for 15 minutes on each side or until crispy. ; Serve with your favorite entree or try it with English Fried Fish (see recipe notes). ; ; – Use organic ingredients whenever possible.